Intuitive experiences often address questions relating to the meaning and purpose of life. But the experiences are private and unique; although different individuals may have similar experiences, each has his own separate experience which is difficult to put into words and describe to another. It is this privateness, this inaccessibility to public scrutiny that is the weakness of intuitive knowledge. How many puzzles you solve is not as important as how many you enjoy thinking about. The nature of consciousness can not be sufficiently understood within the framework of classical physics but must be sought within the alternative representation of physical reality provided by quantum mechanics. related to the second and third patterns of vibration of the string, respectively. This simple discovery had a profound effect on Pythagoras of Samos and his followers. It was an unexpected but profound connection between numbers and nature, and it led Pythagoras to conclude that there is a harmony in nature. Nature he thought is commanded by numbers. The scientists have argued that the subjective, phenomenal states that make up the life of the mind are intimately linked to the information expressed at that time by the brain. Science seeks to understand the physical world from which sensory data originate. It seeks to find a relatively few laws and general principles through which the broad range of phenomena can be understood. To facilitate this understanding, science uses the laws to create models of reality. The quantum consciousness theory proposes that classical mechanics cannot explain the consciousness, while quantum mechanical phenomena, such as quantum entanglement and superposition can play an important part in the brain's function, and could form the basis to explain the consciousness. The amount of integrated information that an individual possesses corresponds to its level of consciousness. In the holistic nature of quantum mechanics and the phenomenon of entanglement, particles that have interacted continue to have their natures depend upon each other even after their separation. This model is explaining the coherence of consciousness, but also can be invoked as a more general challenge to the atomistic conception of traditional physics according to which the properties of wholes are to be explained by appeal to the properties of their parts plus their mode of combination. A qubit or quantum bit is the analog of a bit for quantum computation. Different than an ordinary bit which has two possible values called 0 and 1, a qubit may assume values of the form a|0› + b|1› where a and b are arbitrary complex numbers satisfying |a|2 + |b|2 = 1. Mental events are a `prior level' of `implicit events' whose operation is needed in order to produce the potentialities for physical events. Consciousness is exercising top level control over neural excitation in the brain. Brain acts as a quantum computer and that quantum coherence is related to consciousness in a fundamental way. Consciousness states are highly differentiated; they are informationally very rich. This information is highly integrated. Conscious systems and conscious mental states both involve many diverse forms of unity. To make precise quantitative statements about nature, we must define the concept of probability in a quantitative way. Consider an experiment having a number of different possible outcomes or results. Here, the probability of a particular result is simply the expected fraction of occurrences of that result out of a very large number of repetitions or trials of the experiment. Thus one could experimentally determine the probability by making a large number of trials and finding the fraction of occurrences of the desired result. The probability of a particular event is the ratio of the number of ways this event can occur, to the total number of ways o/l possible events can occur. The probability of an event that is certain is equal to 1. In the absence of any contrary information, equivalent possibilities may be assumed to have equal probabilities. A probability space is a measure space such that the measure of the whole space is equal to one. A bit is the basic unit of computer information. Regardless of its physical realization a bit always have two states 0 or 1. In a classical computer a bit would have to be in one state(0) or the other(1), but quantum mechanics allows the qubit to be in a superposition of both states at the same time, a property which is fundamental to quantum computing. Bloch sphere is the representation of a qubit. 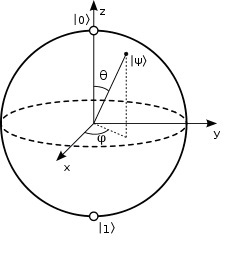 The north and south poles of the Bloch sphere are chosen to correspond to the standard basis vectors |0› and |1›. The pure states of the system correspond to the points on the surface of the sphere; the interior points correspond to the mixed states. Between a qubit and a classical bit an important distinguishing feature is that multiple qubits can exhibit quantum entanglement. And entanglement is a nonlocal property that allows a set of qubits to express higher correlation than is possible in classical systems. When multiple qubits exhibit quantum entanglement, each qubit is in this state it can be thought of as existing in two universes, as a 0 in one universe and as a 1 in the other. Any operation on such a qubit in fact acts on both values at the same time. The major point being that by performing the single operation on the qubit, we have performed the operation on two different values. Similarly a two-qubit system would perform the operation on 4 values, and a three-qubit system on eight values. The state of the system is represented by a single vector known as a ket. In any vector space if a basis is chosen for the Hilbert space of a system, then any ket can be expanded as a linear combination of those basis elements. What is entangled is the observable of the system. An observable in quantum mechanics is represented typically by a Hermitian operator, and the system being entangled typically will produce an eigenvalue of the system. Quantum mechanics predicts correlated outcomes in space-like separated regions for experiments using two-particle entangled states. Quantum correlations somehow reveal dependence between the events, or logical order. The Law of Polarity states that opposites are really two extremes of the same thing. There is neither good nor evil; there is only wisdom and ignorance. I consider the consciousness a probability space and the measure of the whole space is equal to one and because of the consciousness polarity I will define the qubit of consciousness and the consciousness states keeping the analogy with the qubits and the quantum states from quantum mechanics. I define a qubit of consciousness as an event in our life. The quantum state-vector corresponds more or less directly to whatever exists in reality, and that it is in fact all that exists in reality. What is in the present state of human consciousness appears to have two poles the positive and negative poles, good and evil, heaven and hell, life and death, light and darkness, day and night, white and black, South and North, peace and war, yes and no, positive and negative, etc. In everything there are two poles, or opposite aspects, and opposites are really only the two extremes of the same thing. To represent the state of an n-qubit consciousness system on a classical computer would require the storage of 2ncomplex coefficients. Although this fact may seem to indicate that qubits can hold exponentially more information than their classical counterparts. If you measure the three consciousness qubits, you will observe a three-bit string. The probability of measuring a given string is the squared magnitude of that string's coefficient ( the probability of measuring 000 = |a|2 , the probability of measuring 001 = |b|2 etc.). Measuring a consciousness quantum state described by complex coefficients (a,b,...,h) gives the classical probability distribution ( |a|2, |b|2,…, |h|2 ) and we say that the consciousness quantum state collapses to a classical state as a result of making the measurement(the event happened in your life). For example an eight-dimensional vector can be specified in many different ways depending on what basis is chosen for the space. The basis of bit strings (e.g., 000, 001,…,111) is known as the computational basis. The mathematical formalism of quantum theory provides an algorithm for computing the probabilities of outcomes of measurements made in experiments. For example before a quantum object is measured, it does not have definite characteristics. Instead, it exists in a superposition of multiple mutually contradictory states—allowing it to be in two places at once. When a consciousness state will become certitude? People with higher consciousness will have more consciences qubits and more consciousness states. If you have N consciousness qubits in the higher consciousness plane you will have 2N consciousness qubits. Because of evolution (another proof for my evolution theory) here on earth people have less consciousness qubits and less consciousness states than those who are in heaven. Because John the Baptist had at that time less consciousness qubits and less consciousness states than those who are in the kingdom of heaven.